For the first eight years of his NHL life, Kane, whose first big-league goal came on October 8, 2009, against the St. Louis Blues, was thrust into the role of post-season spectator rather than participant. On February 26 of this year, the left wing was dealt from Buffalo to San Jose for Daniel O’Regan and San Jose's 1st round (conditional) pick in 2019 NHL Draft and 4th round (conditional) pick in 2020 NHL Draft. In 17 games down the stretch with the Sharks, Kane responded with 14 points, including nine goals (one short-handed), while averaging 20:15 of ice time. 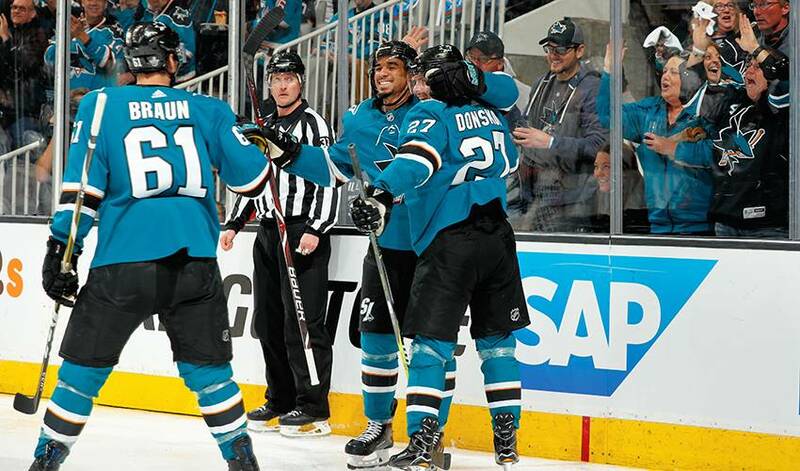 In Game 1 of San Jose’s opening round Playoff series against Anaheim, the 26-year-old carried over his strong regular season form in the form of two goals and Third Star honours in a 3-0 Sharks win. It was Kane’s first post-season contest after playing 574 regular season NHL games with Atlanta, Winnipeg, Buffalo and San Jose. By the series end – a four-game San Jose sweep – Kane recorded three goals and one assist, averaging 18:18 of ice time. What was he most proud of when it came to his efforts? The fourth overall selection in the 2009 NHL Entry Draft will look to keep the momentum going against the upstart Vegas Golden Knights, who swept the Los Angeles Kings in four games in their first-round series. The first time Kane faced the Golden Knights – he was with the Sabres – on October 17, he recorded one goal and two assists. Currently, the Golden Knights lead the Sharks two games to one after a 4-3 victory on Monday night in San Jose. Kane had a goal in the overtime loss. A big reason behind his stellar showing with the Sharks can be traced to Kane’s comfort level with his new teammates. A 2007 Memorial Cup winner, Kane, who was part of the Canadian team that won gold medals at the 2008 Ivan Hlinka Memorial Cup and the 2009 IIHF World Junior Championship, is hoping there are even better days ahead for himself and his teammates.